Qatar, officially the State of Qatar, is an emirate in the Middle East and Southwest Asia, occupying the small Qatar Peninsula on the northeastern coast of the larger Arabian Peninsula. It is considered one of the fifteen states that comprise the so-called "Cradle of Humanity." The discovery of oil reserves, beginning in the 1940s, transformed the nation's economy, delivering a high standard of living, with many social services and all the amenities of any modern nation. The nation's traditions draw on its nomadic past and are centuries old. However, its population is urban and coastal and its daily life is thoroughly modern. The rulers have sought to enhance civil liberties; the press is among the freest in the region. The native Qatari population lives side by side with newcomers who have been drawn to Qatar by economic opportunity. 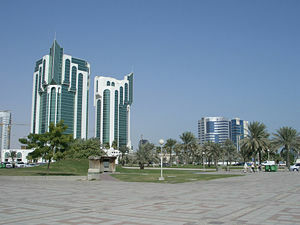 Qatar shares its land border with the United Arab Emirates, with which, in 1993, it continued to have a dispute in the Khawr al Udayd area. The boundary with Saudi Arabia was settled in 1965, but never demarcated. Qatar's northwest coast is fewer than 20 miles (30 km) from Bahrain. Qatar occupies 4,416 square miles (11,437 square kilometers), is 100 miles (160 km) long, and is slightly smaller than the state of Connecticut in the United States. Much of the country consists of a low, barren plain covered with sand. To the southeast lies the spectacular Khor al Adaid (Inland Sea), an area of rolling sand dunes surrounding an inlet of the Gulf. The highest point is at Jebel Dukhan to the west, a range of low limestone outcrops running north-south from Zikrit through Umm Bab to the southern border, and reaching about 295 feet (90 meters) above sea level. This area contains Qatar's main onshore oil deposits, while the natural gas fields lie offshore, to the northwest of the peninsula. The climate is very hot, with temperatures averaging over 104°F (40°C) from May to September, with high humidity. Winter temperatures may fall to 60° F (17°C), which is relatively cool for the latitude. Rainfall is negligible, averaging four inches (100 mm) a year, confined to the winter months, and falling in brief, sometimes heavy storms that often flood the small ravines and usually dry wadis. 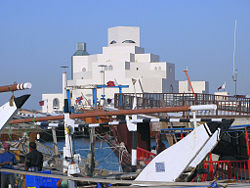 The capital, Doha, is located on the central east coast on a sweeping (if shallow) harbor. It is the major administrative, commercial, and population center. Other ports include Umm Said, Al Khawr, and Al Wakrah. Only Doha and Umm Said are capable of handling commercial shipping, although a large port and a terminal for loading natural gas are planned at Ras Laffan, north of Al Khawr. Coral reefs and shallow coastal waters make navigation difficult in areas where channels have not been dredged. Like the other Arab emirates on the Persian Gulf—Kuwait, Bahrain, the United Arab Emirates, Qatar has been inhabited for millennia, and was part of the Persian Empire and Persian Gulf trade route connecting Mesopotamia and the Indus Valley. Mostly, the arid climate fostered only short-term settlements by nomadic tribes. Clans such as the Al Khalifa and the House of Saud (which would later ascend thrones of Bahrain and Saudi Arabia respectively) swept through the Arabian Peninsula and camped on the coasts within small fishing and pearling villages. In the 1760s, members of the Al-Khalifa of the Utub tribe migrated from Kuwait and central Arabia and established a pearling and commercial base at Zubarah in the north of Qatar. During the nineteenth century, when the British sought out Qatar and the Persian Gulf as an intermediary vantage to their colonial interests in India, the Al Khalifa clan reigned over the northern Qatari peninsula from the nearby island of Bahrain to the west. In 1868, at the request of Qatari nobles, the British negotiated the termination of the Al Khalifa claim to Qatar, except for the payment of tribute. The tribute ended with the occupation of Qatar by the Ottoman Turks in 1872, when the Al Khalifa family moved to Bahrain. Although Qatar was a dependency, resentment festered against the Bahraini Al Khalifas along eastern Qatar. Muhammad bin Thani was elected sheikh and ruled in Al-Bida (later known as Doha) from 1850 to 1878. The Al Thani family had lived in Qatar for 200 years, and belong to the Al-Maadeed clan of the Bani Tamim tribe, one of the largest Arab tribes, whose history goes back to pre-Islamic times. In 1867, the Al Khalifas sent a naval force to Al Wakrah to quash the Qatari rebels, in violation of an 1820 Anglo-Bahraini treaty. Britain censured Bahrain and recognized Mohammad bin Thani as the representative of the Qatari people. This diplomatic foray ensured the Al Thani family a role as rulers of the territory. Later, Qasim Al-Thani (Mohammad's son) accepted the title of governor from the Ottoman Turks, who were trying to establish authority in the region. Qasim Al-Thani defeated the Turks in 1893, an event taken to confirm Qatar's autonomy. When the Turks left at the beginning of World War I, the British recognized Sheikh Abdullah bin Jassim Al Thani as ruler. The 1916 treaty between the United Kingdom and Sheikh Abdullah, like those between the British with other Gulf principalities, required the ruler not to dispose of any territory except to Britain, and not to deal with any other foreign government without British consent. In return, the British promised to protect Qatar. A 1934 treaty granted more extensive British protection. In 1935, a 75-year oil concession was granted to Qatar Petroleum Company, which was owned by Anglo-Dutch, French, and United States interests. High-quality oil (petroleum) was discovered, in 1940, at Dukhan, on the western side of Qatar. Exploitation was delayed by World War II, and oil exports did not begin until 1949. During the 1950s and 1960s, gradually increasing oil production brought prosperity, rapid immigration, substantial social progress, and the beginnings of Qatar's modern history. 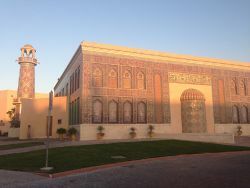 The Museum of Islamic Arts. Pressure for a British withdrawal from the Arab emirates in the Persian Gulf increased during the 1950s, and the British welcomed Kuwait's declaration of independence in 1961. When Britain announced, in 1968, that it would disengage politically, though not economically, from the Persian Gulf by 1971, Qatar joined Bahrain and seven other Trucial States in a federation. Regional disputes resulted in Qatar leaving the coalition that would evolve into the United Arab Emirates. In September 1971 Qatar became independent. Since 1995, Emir Hamad bin Khalifa Al Thani has ruled Qatar, seizing control of the country from his father Khalifa bin Hamad Al Thani while the latter vacationed in Switzerland. Under Emir Hamad, Qatar has experienced a notable amount of liberalization, including the enfranchisement of women, a new constitution, and the launch of Al Jazeera, the controversial Arabic language satellite television news channel. Qatar ranks as the eleventh-richest country in the world per capita. Qatar served as the headquarters and one of the main launching sites of the U.S. invasion of Iraq. In 2005, a suicide-bombing killed a British teacher at the Doha Players Theatre, shocking a country that had not previously experienced terrorism. 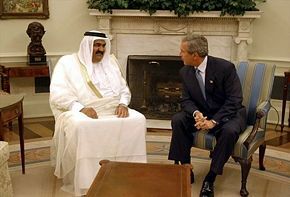 Emir Hamad bin Khalifa al-Thani with President George W. Bush. The politics of Qatar take place in a framework of an absolute monarchy whereby the Emir of Qatar is not only head of state, but also the head of government. The head of state is the emir, and the right to rule Qatar is passed on within the Al Thani family. Politically, Qatar is evolving from a traditional society into a modern welfare state. As a hereditary monarch, the emir also holds the positions of Minister of Defense and Commander-in-Chief of the Armed Forces. Emir Hamad bin Khalifa al-Thani has been emir since June 1995. His fourth son, Crown Prince Tamin bin Hamad bin Khalifa al-Thani, is heir apparent. There is a prime minister. The emir appoints the Council of Ministers. There are no elections. The legislature comprises a unicameral advisory council or Majlis al-Shura. The 35 members are appointed. No legislative elections have been held since 1970, when there were partial elections. Council members have had their terms extended every four years since. A new constitution, which came into force in June 2005, provides for a 45-member Consultative Council, or Majlis al-Shura. The public would elect two-thirds of the Majlis al-Shura, and the emir would appoint the remaining members. Elections were planned for late 2007. Suffrage is universal for those aged 18 years and over. The judiciary comprises courts of first instance, appeal, and cassation (annulment). The emir appoints all judges based on the recommendation of the Supreme Judiciary Council—for renewable three-year terms. The legal system is a discretionary system of law controlled by the emir, although civil codes are being implemented. Islamic law dominates family and personal matters. Qatar explicitly uses Wahhabi law, a puritanical version of Islam which takes a literal interpretation of the Qur'an as the basis of its government. In the early twentieth century, when the Al-Thanis realized that converting to the doctrine of their larger neighbor might bode well for the survival of their regime, they imported Wahhabi Islam from Saudi Arabia. Wahhabism takes a more tolerant form in Qatar than in Saudi Arabia, though it still governs a large portion of Qatari mores and rituals. The Basic Law of Qatar, 1970, institutionalized customs rooted in Qatar's Wahhabi heritage, granting the emir pre-eminent power. The emir's role is influenced by continuing traditions of consultation, rule by consensus, and the citizen's right to appeal personally to the emir. The emir, while directly accountable to no one, cannot violate the Shari’a (Islamic law) and, in practice, must consider the opinions of leading notables and the religious establishment. Their position was institutionalized in the advisory council, an appointed body that assists the emir in formulating policy. There is no electoral system. Political parties are banned. The influx of expatriate Arabs has introduced ideas that call into question the tenets of Qatar's traditional society, but there has been no serious challenge to Al Thani rule. The country has undergone a period of liberalization and modernization after Hamad bin Khalifa Al-Thani came to power. Under his rule, Qatar became the first Persian Gulf country where women gained the right to vote. Also, women can dress mostly as they please in public (although in practice local Qatari women generally don the black abaya). Before the liberalization, it was taboo for men to wear shorts in public. The laws of Qatar tolerate alcohol to a certain extent. However, public bars and nightclubs operate only in expensive hotels, much like in the Emirates and Bahrain, though the number of establishments has yet to equal that of UAE. The 15th Asian Games brought further liberalization, but Qatari authorities are cautious of becoming too liberal. Qatar is divided into 10 municipalities: Ad Dawhah, Al Ghuwariyah, Al Jumaliyah, Al Khawr, Al Wakrah, Ar Rayyan, Jariyan al Batnah, Ash Shamal, Umm Salal, Mesaieed, Old Airport. Qatar's military is made of soldiers from other Arabian Peninsula countries. This Middle Eastern Alliance is called the United Persian Gulf Fighters. It includes soldiers from Qatar, Bahrain, United Arab Emirates and Oman. 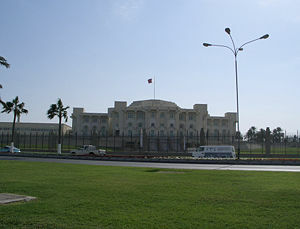 Most soldiers come from Oman, but the headquarters is set in Doha, Qatar. To Western eyes, the Qatari authorities seem to keep a relatively tight rein on freedom of expression and moves for equality. But when compared to Saudi Arabia, Qatar boasts one of the best standards-of-living and quality-of-life in its region. Freedom in the World 2006 lists Qatar as "Not Free," and on a one-to-seven scale ("one" being the most free) rates the country a "six" for political rights and five for civil liberties. Qatar's great wealth is most visible in its capital, Doha. Prior to the discovery of oil, the economy of the Qatari region focused on fishing and pearling. After the introduction of the Japanese cultured pearl on to the world market in the 1920s and 1930s, Qatar's pearling industry faltered. However, the discovery of oil reserves, beginning in the 1940s, transformed the nation's economy. Now the country has a high standard of living, with many social services and all the amenities of any modern nation. Qatar's national income primarily derives from oil and natural gas exports. The country has oil estimated at 15 billion barrels (2.4 km³), while gas reserves in the giant north field, which straddles the border with Iran and is almost as large as the peninsula itself, are estimated to be between 800-900tcf (Trillion Cubic Feet—1tcf is equal to around 80 million barrels of oil equivalent). Qataris' wealth and standard of living compare well with those of Western European nations; Qatar has the highest gross domestic product per capita in the Middle East, nine places ahead of nearest competitor United Arab Emirates. With no income tax, Qatar is also one of the two least-taxed sovereign states in the world. While oil and gas are likely to remain the backbone of Qatar's economy, the country seeks to stimulate the private sector and develop a "knowledge economy." In 2004, it established the Qatar Science and Technology Park to attract and serve technology-based companies and entrepreneurs, from overseas and within Qatar. For the 15th Asian Games in Doha in 2006, it established a "sports city" consisting of Khalifa Stadium, the Aspire Sports Academy, aquatic centers, exhibition centers and many other sports related buildings and centers. Qatar pursues a program of "Qatarization," under which all joint venture industries and government departments strive to move Qatari nationals into positions of authority. Growing numbers of foreign-educated Qataris are returning home to assume key positions formerly occupied by expatriates. Qatar has tightened the administration of its foreign manpower programs in the interests of security. The Qatar Financial Centre provides a world class financial services platform situated in an economy founded on the development of its hydrocarbons resources. Apart from Qatar itself, which needs to raise the capacity of its financial services to support more than $130 billion worth of projects, the QFC also provides a conduit for financial services providers to access nearly $1 trillion of investment over the next decade. The largest project ever in Qatar, the new town of Lusail City, is under construction. Qatar has a modern telecommunication system centered in Doha. Qtel's ISP branch, Internet Qatar, uses SmartFilter to block websites they deem inappropriate to Qatari interests and morality. Al Jazeera, a television network headquartered in Doha, was initially launched as an Arabic news and current affairs satellite TV channel of the same name, but has expanded into a network of several specialty TV channels. Expatriates have been permitted to buy land in several areas of Doha, including the West Bay Lagoon, the Qatar Pearl and the new Lusail City. Ownership by foreigners entitles them to a renewable residency permit, which allows them to live and work in Qatar. Exports totaled $33.25 billion in 2006. Export commodities included liquefied natural gas, petroleum products, fertilizers, and steel. Export partners included Japan 36.9 percent, South Korea 19.4 percent, and Singapore 8.2 percent. Imports totaled $12.36 billion. Import commodities included machinery and transport equipment, food, chemicals Import partners included France 11.4 percent, Japan 10.4 percent, the United States 10.3 percent, Germany 8.3 percent, Saudi Arabia 7.2 percent, UK 6.9 percent, Italy 6.5 percent, South Korea 5.5 percent, United Arab Emirates 4.8 percent. Per capita GDP was $31,397 in 2005, a rank of 11 out of 194 nations. 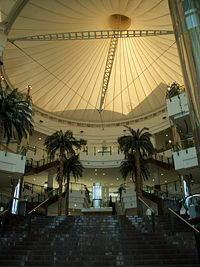 The Doha City Center mall. Many Qataris are descended from a number of migratory tribes that came to Qatar in the eighteenth century to escape the harsh conditions of the neighboring areas of Nejd and Al-Hasa on the Arabian Peninsula. Some are descended from Omani tribes. The number of people in Qatar fluctuates considerably depending on the season, since the country relies heavily on migrant labor. In early 2017, Qatar's total population was 2.6 million, of which only 313,000 (12 percent) were Qatari citizens. Non-Arab foreigners make up the vast majority of Qatar's population; Indians are the largest community, numbering 650,000 in 2017, followed by 350,000 Nepalis, 280,000 Bangladeshis, 260,000 Filipinos, 200,000 Egyptians, 145,000 Sri Lankans and 125,000 Pakistanis among many other nationalities. Arabs make up 40 percent of the population, Pakistanis 18 percent, Indians 18 percent, Iranian 10 percent, and others 14 percent. Residents of Qatar may be classified in three groups: The Bedouin, Hadar, and Abd. The Bedouin descend from the nomads of the Arabian Peninsula. The Hadar's forebears were town dwellers, and most descend from migrants from present-day Iran, Pakistan, and Afghanistan. The Abd descend from slaves brought from east Africa. All three groups identify themselves as Qatari. Religion is not indicated on national identity cards and passports, nor is it a criterion for citizenship in Qatar according to the Nationality Law. Ninety five percent of Qatar’s population, including the ruling family, are Sunni Muslims. Of the citizen population, Shi'a Muslims account for approximately 10 percent and Sunni Muslims, specifically Wahhabis, comprise the remaining 90 percent. The Iranian Revolution, the Iran-Iraq War, and alleged discrimination against Shi'a Muslims have exacerbated sectarian tensions, although these divisions are rarely discussed openly. Non-citizens are Sunni and Shi'a Muslims, Christians, Hindus, Buddhists, and Baha'is. Most foreign workers and their families live near the major employment centers of Doha, Al Khor, Messaeed, and Dukhan. The Christian community is a diverse mix of Indians, Filipinos, Europeans, Arabs, and Americans. It includes Catholic, Orthodox, Coptic, Anglican, and other Protestant denominations. There are some limitations on the religious liberty of Christians. No foreign missionary groups may operate openly. The Hindu community is almost exclusively Indian, while Buddhists include South and East Asians. Most Baha'is in Qatar may come from nearby Iran. Arabic serves as the official language. The Qatari dialect of Arabic is similar to the version spoken in the other Gulf States. Farsi, the official language of Iran, is widely spoken by families that trace their descent from that country. As a result of the influx of foreign workers, other languages spoken include English, Urdu and Hindi, Malalayam, and Tagalog. While many Qataris speak more than one language, it is rare for immigrants to learn Arabic. Communication between Arabs and foreign workers are conducted in English or the language of the expatriate. Women tend to take government jobs, particularly in education, health, and social affairs. Foreign women are hired as maids, nannies, teachers, nurses, and clerical or service workers. High-level positions are held by men. Women have access to schooling and employment and may drive and travel outside the country. Islamic customs mean women may feel uncomfortable among strangers in public, so some department stores, malls, parks, and museums have "family days" during which men must accompany their families. Most marriages are arranged, the initial inquiries being made by the mother and sisters of the groom about prospective brides, who may accept or refuse any proposal. It is common for several members of two lineages to be married. Government permission is required for any marriage to non-Gulf citizens—and the citizen may have to give up government employment and other benefits. Polygamy is permitted, and is common among the ruling family. The practice has declined because a wife can divorce her husband if he takes another wife, and because of increasing costs of maintaining more than one household. Both women and men may file for divorce. Young children stay with the mother, but when they reach adolescence, custody reverts to the father. The divorce rate has risen sharply since 1980. Qataris prefer to live with or near members of the husband's family, either within a single extended household, a walled family compound with separate houses, or by living in the same neighborhood. Extended, joint, and nuclear households are common. Descent is through the male line, and ties are close within that lineage. Women are partly integrated into their husbands’ lineage. Children of polygamous marriages tend to identify most closely with siblings from the same mother. Women care for children, although foreign nannies have brought new child-care practices. Qatar has placed great emphasis on education. Along with the country’s free healthcare to every citizen, education is free and compulsory for children of both native citizens and immigrant workers, from kindergarten through to university. Students who qualify for higher education abroad can obtain scholarships to offset the costs of tuition, travel, and living abroad. Boys and girls are schooled separately. Doha is also home to numerous international schools established for its expatriate communities, and dozens of different private schools. Education has been a big focus of the Qatari government, which has led to the development of organizations such as the Qatar Foundation, which operates Education City. Located on the outskirts of Doha, Education City covers 14 million square meters and houses educational facilities from school age to research level and branch campuses of some of the world's leading universities. The country has one university, the University of Qatar, and a number of higher educational institutions. The University of Qatar had some 7,300 students in 1993. In 1994, 3.4 percent of the country’s gross national product was spent on education. An adult education program has been instituted, with a particular focus on adult literacy. The literacy rate (those aged 15 and over who can read and write) for the total population was 82.5 percent in 2003, with literacy for women at 85 percent, ahead of that for men, at 81.4 percent. Qataris are stratified according to tribal affiliation, religious sect, historical links to settlement patterns, and occupation. Irani-Qataris dominate crafts, and freed slaves tend to be involved in entertainment and the police force. The hiring of foreign workers has created a pattern in which certain nationalities are concentrated in particular jobs. The atmosphere is comfortably tolerant. Foreign workers retain their national dress. Markets carry a range of international foods, music, and films. Doha is home to more than 80 percent of Qatar’s population, and is characterized by modern, award-winning architecture that attempts to fuse the modern with the traditional. Many building designs incorporate architectural elements resembling desert forts and towers or have distinctively Islamic decorative styles executed in modern materials. At the start of the twenty-first century, the city was going through a boom in construction. The state provides citizens with interest-free loans to build homes in low-density housing areas. Foreign workers live in rental units or employer-provided housing and dormitories. Many native varieties of dates and seafood feature in the cuisine. Machbous, a traditional dish, comprised of richly spiced rice combined with meat or seafood and served from a large communal platter. The main meal is at midday, although with more Qataris working, evening family meals have become common. The Friday midday meal, after prayers, is the main gathering of the week for many families. During the month of Ramadan, when Muslims fast from dawn to dusk, elaborate meals are served at night. Arabian coffee sweetened and spiced with cardamon is served in small thimble-shaped cups. Sweet coffee (qahwa helw), a vivid orange combination of saffron, cardamon, and sugar, is served on special occasions. Restaurants and fast-food franchises cater to foreign workers. Qatari men sometimes socialize and conduct business in restaurants and coffeehouses. Tea, coffee, food, and a cool place to sit is offered to any visitor. It is rude not to accept hospitality. 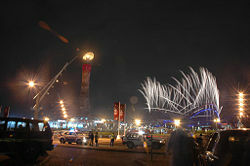 View of the Sports City during the 2006 Asian Games Opening Ceremony. The culture of Qatar is based on Bedouin poetry, song and dance. Traditional dances in Doha are performed on Friday afternoons. One such dance is the ardah, a stylized martial dance performed by two rows of dancers who are accompanied by an array of percussion instruments, including the al-ras (a large drum whose leather is heated by an open fire), tambourine and cymbals, along with small drums. Other instruments include the oud and rebaba, both stringed instruments, as well as the Arabian flute. Khaliji music, which is in the style of the traditional Bedouin music, dominates the airwaves in Doha] as well as in the rest of the country. The Qatari Gulf Folklore Center is one of the pre-eminent centers for the study of the folk music of the Persian Gulf. Doha is home to a number of sports stadiums, many of which were renovated in preparation for the 15th Asian Games, held in December 2006, which Doha spent $2.8 billion for preparation. Doha also hosted the Third West Asian Games in December 2005. Doha is also expected to host the 2011 Asian Indoor Games. ASPIRE Academy, launched in 2004, is a sports academy that aims to create world-class athletes. It is situated in the Sports City Complex, which also includes the Khalifa International Stadium, the Hamad Aquatic Centre and the Aspire Tower. The MotoGP motorcycling grand prix of Doha is held annually at Losail International Circuit, located just north of the city. Doha is expected to submit a bid for the 2016 Summer Olympics. ↑ Monthly figures on total population Ministry of Development Planning and Statistics. Retrieved July 17, 20107. ↑ The General Census of Population and Housing, and Establishment Apr - 2010. Retrieved July 17, 2017. ↑ 3.0 3.1 3.2 Report for qatar (PPP valuation of country GDP) IMF, October 2016. Retrieved July 17, 2017. ↑ Report for Selected Countries and Subjects (PPP valuation of country GDP) IMF, October, 2016. Retrieved July 17, 2017. ↑ Population of Qatar by nationality - 2017 report Retrieved July 17, 2017. Crystal, Jill. Oil and Politics in the Gulf Rulers and Merchants in Kuwait and Qatar. Cambridge, England: Cambridge University Press, 1990. ISBN 0521366399. Ferdinand, Klaus, and Ida Nicolaisen. Bedouins of Qatar. New York: Thames and Hudson, 1993. ISBN 0500015732. Field, Michael. The Merchants the Big Business Families of Saudi Arabia and the Gulf States. Woodstock, NY: Overlook Press, 1985. ISBN 0879519711. Peck, Malcolm C. Historical Dictionary of the Gulf Arab States. Lanham, MD: Scarecrow Press, 1997. ISBN 0810832038. Zahlan, Rosemarie Said. The Creation of Qatar. London: Croom Helm, 1979. ISBN 0064979652. This page was last modified on 28 July 2017, at 14:56.